Ryan Day has said a lack of focus and a succession of missed opportunities were behind his first-round World Championship exit. The Welshman led 3-1 before losing 10-3 to world number 12 Mark Allen at Sheffield's Crucible Theatre. "I orchestrated my own downfall with the chances I missed," Day said. "I was in control at 3-1 and the interval came at the wrong time and I lost focus and never really regained it." 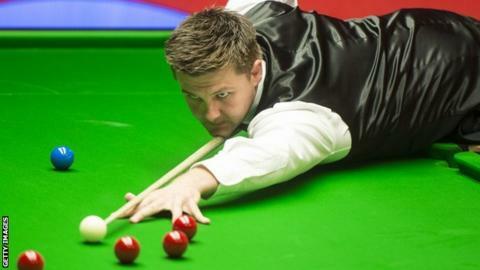 Day came through three qualifying rounds to reach snooker's showpiece event. The world number 20 looked in good shape in taking an early lead but Allen edged the fifth frame and managed to sneak the sixth after Day missed a good opening. Northern Irishman Allen said he "never looked back" after that, scoring four half-centuries and a ton in the the final five frames. A demoralised Day told BBC Radio Wales: "Things didn't go my way and Mark started playing as he can, but I should have been in front after the first session. "I missed the boat. I was feeling quite good and I don't know what happened. "I switched off mentally and lost lots of frames I should have won in the second mini-session. I missed chance after chance. "I have won matches from 6-3 before, but things didn't really happen and that was that." Allen will meet Barry Hawkins in round two. Elsewhere, Matthew Stevens claimed a five-frame advantage, after the first session, over fellow Welshman Mark Williams in a repeat of the 2000 World Championship final. Five-time winner Ronnie O'Sullivan or Craig Steadman will face Williams or Stevens in the next round. Also at the Crucible on Tuesday, two-time finalist Ali Carter said he is "here to win" this tournament as he progressed past Alan McManus. And China's Ding Junhui reached round two despite miscalculating his score in one frame to miss out on the chance of a maximum 147 break.